Account based marketing is a B2B marketing strategy where sales & marketing teams focus their efforts on highly targeted named accounts instead of targeting a wide set of audience in their lead generation efforts. An important aspect of ABM is to identify the key influencers at important accounts and spend your marketing resources in personalizing messages to convert those accounts into customers. This may involve creating unique messages to address targeted accounts business challenges and needs. It is a whole new way to make your marketing & selling customer centric. ABM efforts involve understanding the relationship between incoming leads & accounts and create a link between leads & existing accounts or opportunities. The challenge is that natively Salesforce does not tie in leads with accounts which results in a divide between leads & contacts, opportunities & accounts. So when a lead comes in from a named account, if you are using traditional salesforce lead assignment rules or round robin and without any account association, the leads will get routed to a new sales rep and hence lose the account context. leads coming in from same companies going to different reps.
Lead to Account matching enables you to associate incoming leads automatically with existing accounts in your CRM. Using this information, you can associate leads with existing account owners. For example: An Incoming lead with the company name Acme can be automatically linked to an existing account named Acme in your CRM and can be assigned to the account owner. 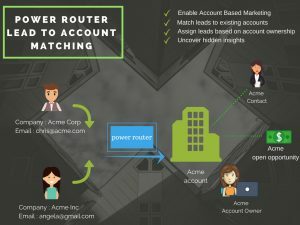 You can learn more here – Implement lead to account matches with Power Router here.